Brittle and scratchy, but Cuphea llavea puts on a gaudy show. And it does it with almost fluorescent colors. The red and black-purple blooms show up as a beacon. 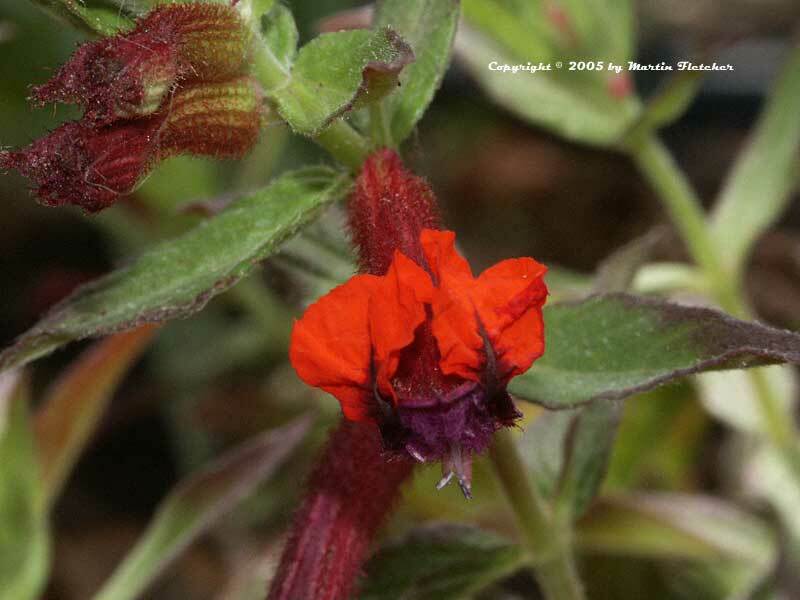 I have had my greatest success with Cuphea llavea growing it in rocks or trailing over a wall. Bat Face Cuphea is frost tender in the high 20°s F, though it will come back from the roots into the low 20°s F. The plants seem to limp for awhile when this happens. Cuphea llavea loves heat and great drainage. The plant pictured is hanging over a south facing rock in well composted gravelly soil. Cuphea llavea is growing robustly. The original Bat Face died during the winter but several seedlings or runners have taken its place. I have managed to keep it going at my house as well in considerably worse conditions and with far less attention on my part. Flowers and foliage of Cuphea llavea the Bat Faced Cuphea. High resolution photos are part of our garden image collection.